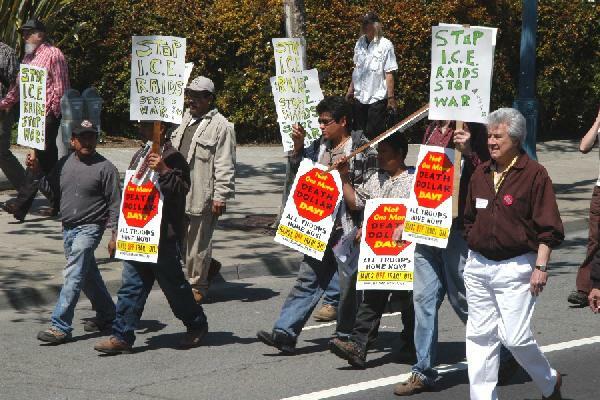 What started on May 1, 2006 as some of the largest political demonstrations in U.S. history for immigrants' rights have in 2008 brought together three fronts -- labor, immigrant, and antiwar -- in one struggle for peace and social justice. 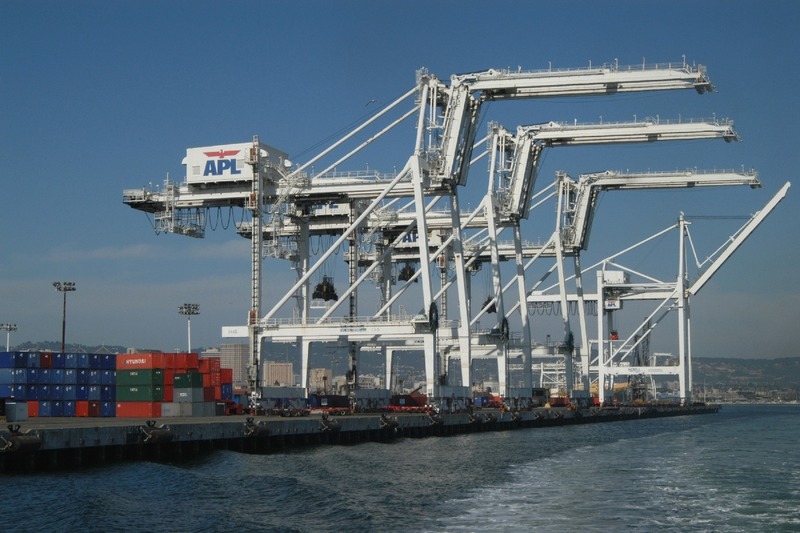 The work stoppage at all 29 West Coast ports on May 1, 2008 by the International Longshore and Warehouse Union (ILWU) was an historic turning point for the U.S. labor movement. For the first time in more than seventy years, a major U.S. trade union led marches and a system-wide strike on May Day. And for the first time ever, it was not for economistic reasons, but for the political demand to end the disastrous and debilitating U.S. wars in Iraq and Afghanistan. 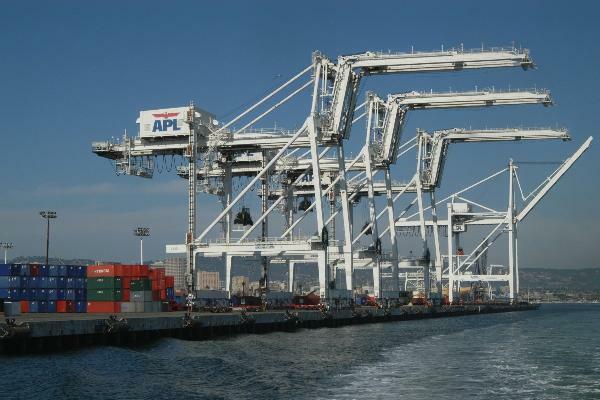 The work stoppage by 25,000 dockworkers idled towering cranes and closed ports from Seattle to San Diego. Truckers refused to cross picket lines. The backlogged ports handle the steady stream of manufactured goods from off-shored factories in Asia in the new globalized economy. Until recently, organized trade unions have been reluctant to reclaim May Day as International Workers' Day in the United States. 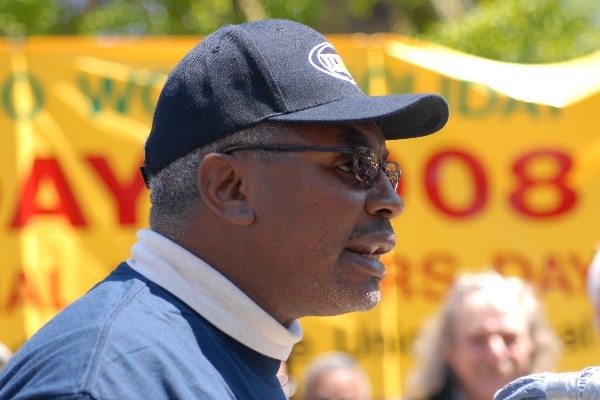 Labor bureaucrats affiliated with the AFL-CIO and Change to Win have declined to support May Day actions because of their collaboration with corporate management in brokering labor contracts. Despite this, individual union locals have begun to support the ILWU and immigrant rights demonstrations on the first day of May. 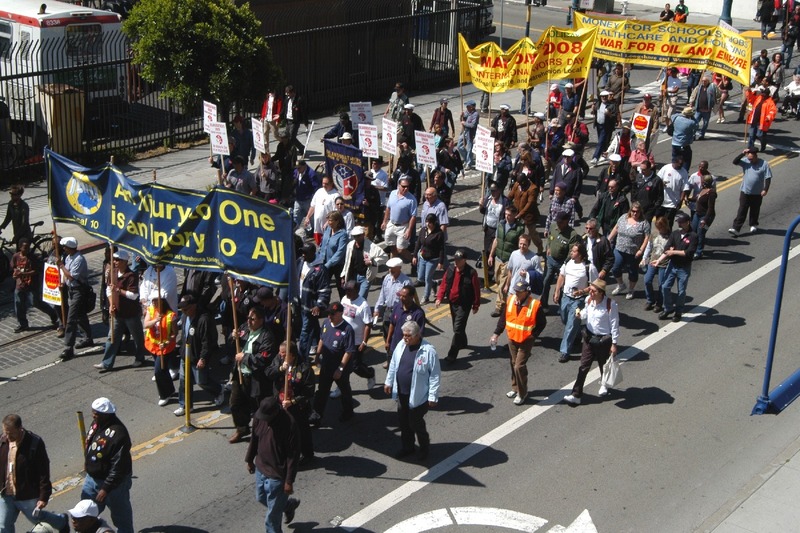 Among the unions that joined in the ILWU-led May Day march in San Francisco were the United Transportation Union Local 1741 (San Francisco school bus drivers), University Professional and Technical Employees (UPTE) union, Inlandboatmen's Union (affiliated with the ILWU), and Oakland Education Association (OEA teachers and school employees). In San José, locals of the Service Employees International Union (SEIU) and Unite Here! joined in the May Day march for immigrant rights. While widely celebrated outside of the United States, May Day itself was born in Chicago during the struggle for the eight-hour working day. A march by striking workers along Michigan Avenue on May 1, 1886 is widely regarded as the world's first May Day march. In mobilizing for May Day, ILWU leader Clarence Thomas had stated that resolutions against the war were important, but they do not stop wars. "But when you stop the ports, the White House listens and the whole world listens," he said to a gathering in Oakland on April 24. Indeed, the impact of the ILWU strike has already been felt around the world. 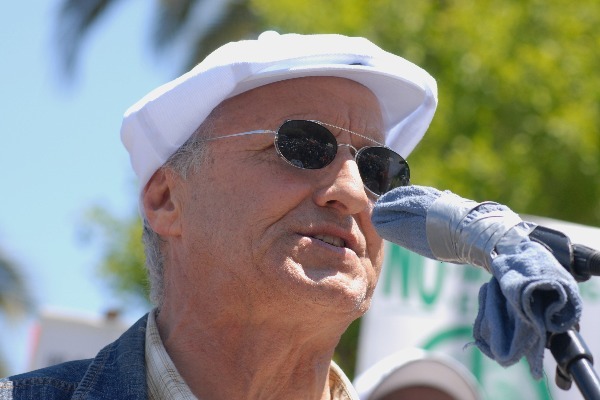 At the May Day rally in San Francisco's Justin Herman Plaza, Thomas broke the news that Iraqi port workers had shut down Iraq's two main cargo ports (Basra and Umm Qasr) in solidarity with the ILWU closure of U.S. West Coast ports. In a prepared statement read by U.S. Labor Against the War (USLAW) coordinator Michael Eisenscher, the Iraqi labor movement reminded the world, "The invaders helped to foment and then exploit sectarian divisions and terror attacks where there had been none. Our union offices have been raided. Union property has been seized and destroyed. Our bank accounts have been frozen. Our leaders have been beaten, arrested, abducted and assassinated. Our rights as workers have been routinely violated." The statement, signed by 37 Iraqi labor leaders, continued, "We demand an immediate withdrawal of all foreign troops from our country, and utterly reject the agreement being negotiated with the U.S.A. for long-term bases and a military presence. The continued occupation fuels the violence in Iraq rather than alleviating it. Iraq must be returned to full sovereignty. … We thank you for standing with us." In addition to trade unions; peace, antiwar, and impeachment organizations were well represented. Three candidates for national political office -- Cindy Sheehan, Cynthia McKinney, and Gloria La Riva -- addressed the rally. There was also a visible demand for immigrants' rights in the ILWU march. A contingent of signs read, "Stop ICE raids. Stop war." The signs were a reminder that the spark that ignited this revival of May Day came on May 1, 2006 when millions of immigrant workers and their families marched throughout the United States in protest against a legislative attempt to criminalize their existence in the country. In the San Francisco Bay Area, the May Day marches of 2007 and 2008 followed in the wake of the largest political demonstration in Northern California's history when more than 250,000 people marched in San José on May 1, 2006. Aerial photos show how the demonstration packed the full width of the street and stretched out for more than 4 miles. May Day 2008 brings together three fronts -- labor, immigrant, and antiwar -- in a common unified struggle for peace and social justice. 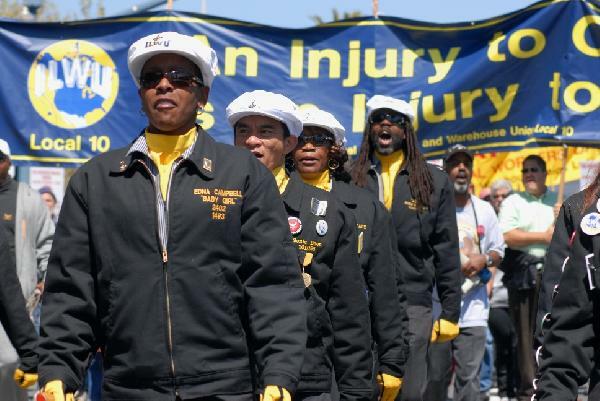 Historic May Day march led by ILWU Local 10 in San Francisco. Immigrant rights and war were critical concerns on May Day: "Stop ICE raids. Stop war." 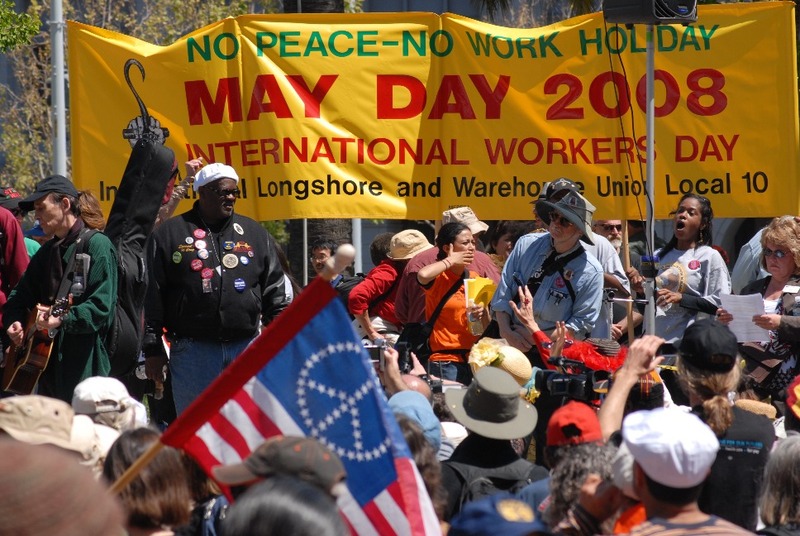 May Day banner of the ILWU reflected on labor and peace. Clarence Thomas evoked the legacy of founding ILWU leader Harry Bridges. Jack Heyman explained the significance of acting on May Day to stop war and precedents in previous ILWU work stoppages. 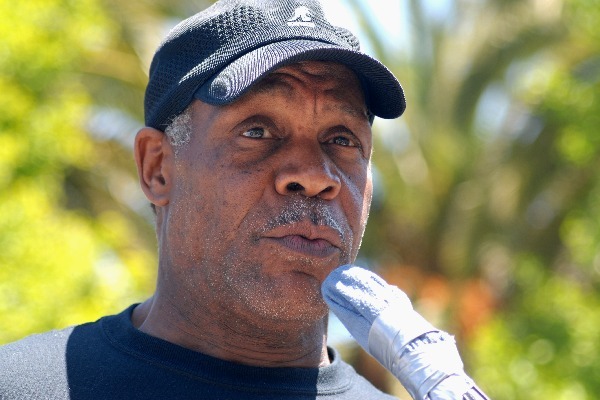 Actor Danny Glover came to give his solidarity to the ILWU. 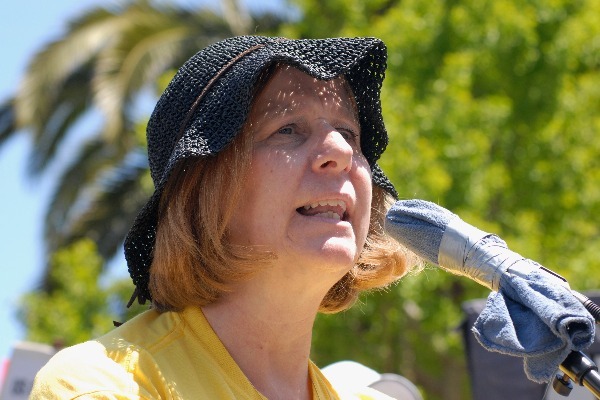 Cindy Sheehan blamed Democrats for funding the war and allowing it to continue. She is running against Nancy Pelosi for Congress. 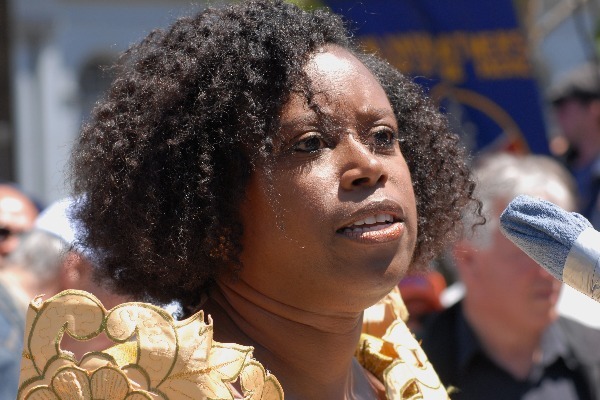 Cynthia McKinney condemned the Bush administration for usurping the power of the people. She is running president on the Green Party ticket. 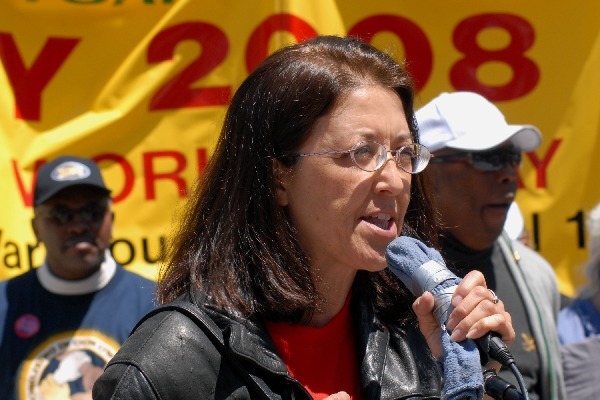 Gloria La Riva congratulated the ILWU for its courageous stand on a political issue that all unions should do. She is a candidate for president with the Party for Socialism and Liberation. 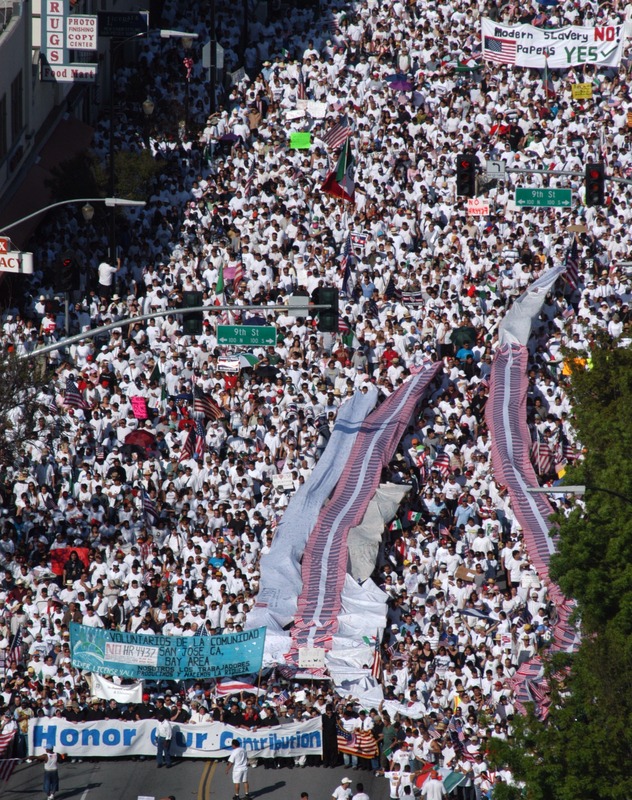 The giant marches of May 1, 2006, such as this one in San José of more than a quarter million people, sparked the revival of May Day in the United States.